Some people are naturally thin. I am not one of those people. I have to bust my booty and watch what I eat like a hawk or the pounds pack on pretty instantly. About 4 months ago I had a minor panic attack because I tried on almost all of my jeans and realized they were not buttoning as easily as usual. I decided to do something about it, and since July, I've lost about 8 lbs (half a pound a week), and my clothes fit right again! This is a huge victory for me as I've struggled majorly with disordered eating. I got back to my comfortable place the right way and without any shortcuts! Weight loss for me is really, really slow. As annoying as it is, it's also manageable and I'm able to maintain once I reach my healthy, normal set point (as in- NOT bone thin!). Crash dieting has never ended well for me. The one and only tried and true approach I've found to health is the good old fashioned way: Balance, real food, good nutrition, and exercise. I've attempted to micromanage my weight in a lot of different ways, a lot of them unhealthy. But in 4 months I lost about a half pound a week and I feel infinitely better. I eat almost the same thing every day. When I get bored of something I exchange it for something new. My digestive system is sensitive and I pay when I don't eat right. I've messed that up enough times to know it's worth it to be careful and stick with what works! I eat carbs, fat, AND protein. I am a vegetarian by preference, but cutting out major food groups doesn't jive well with my idea of balance. I listen to my body and try to eat intuitively. This has taken a LOT of practice and it's something I have to work really hard on to stay in tune with what my body is truly craving. I eat when I'm hungry, I stop when I'm full. I track calories for my own sanity, and I almost always average within 100 calories or so each day without shooting for any specific amount. I allow for flexibility. It was a beautiful day when I realized I can have half a cookie and not gain 5 pounds. This also helps me avoid my historical anxiety when I have a less-than-perfect day. I exercise because I love it. And I exercise hard. I guarantee I could be more toned and sculpted if I lifted weights, but I don't like to. So I don't. 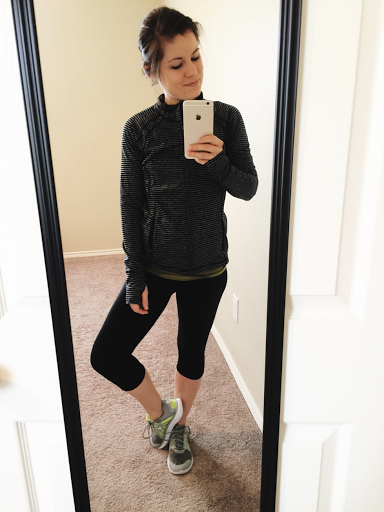 I've tried lots of different workouts but I love to run, so I stick with that! It's the one thing I know I can and will do day in and day out. This doesn't mean I want to do it every day. But I do, and I never regret it. I'm not shooting for perfection here. I can guarantee I'll gain and lose weight again plenty of times in my life. Between hormonal shifts, life changes, and everything else we deal with as women, weight changes are a given. But I know how to recognize when a change is needed, and I've learned how to reset, as difficult as it may be. So feed yourself right. Anything less isn't worth it and it won't work. Eat your fruits and veggies. And don't flip a lid about a cookie. Letting go a little is one of the best things I've ever done!